Me’Lea Conelly, Jonathan Banks and Malcolm in the hall of the Association for Black Economic Power office. Photo by Annabelle Marcovici. In the wake of the killing of Jamar Clark on Nov. 15, 2015 and the ensuing Fourth Precinct occupation, followed less than a year later by the killing of Philando Castile on July 6, 2016, Connelly recalled a drive for a concerted effort with movement organizers to diversify tactics of resistance against police brutality. A meeting was called, and after hours of conversation with a cross section of community, the group voted to create Minnesota’s only Black-led financial institution in North Minneapolis. A symbiotic relationship exists between ABEP and Blexit. 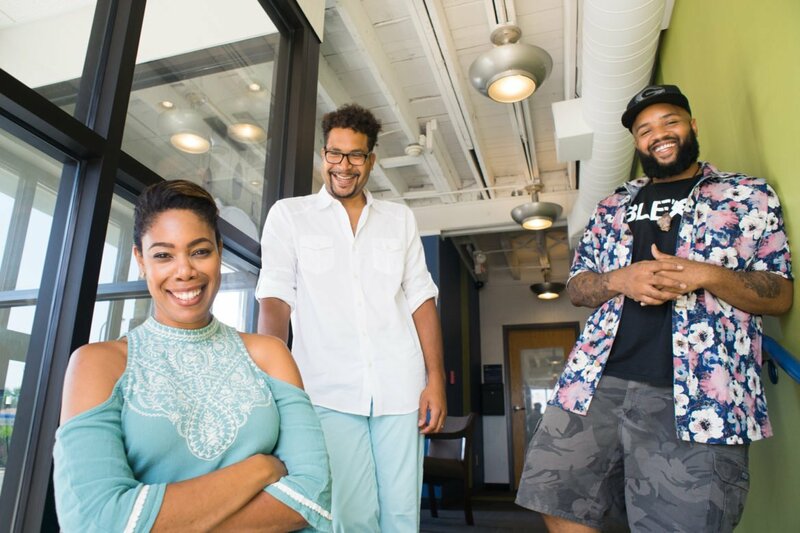 Connelly described Blexit as the incubator and nest where ideas put forth by the community are percolated. ABEP puts them into action. The ABEP Executive Committee composed of – Connelly, Brett Grant, Ron Harris, Amber Jones, Danielle Mkali, Felicia Perry and Y. Elaine Rasmussen – are leading the effort to build the foundations of the credit union while still remaining deeply grounded in the conceptions of resistance movement. But really, Connelly said the decision to launch was an outcome largely driven by community input and demand. Connelly cited the lack of any Black-led financial institutions in the state as a catalyst to this decision by the community. While Minnesota has two Native-led credit unions, White Earth Reservation and Northern Eagle Federal Credit Union, with a total of 120 credit unions across the state, the dominance of white-owned financial institutions in the state looms large. “When you don’t have foundational financial institutions at the roots of certain communities, it’s very difficult for them to become economically healthy and strong,” she explained. To ABEP, the establishment of a credit union in North Minneapolis is a branch of activism and a means of community protection. While a bank is owned by shareholder and is a for profit institution, credit unions are owned by its members. The average annual percentage rate (APR) on payday loans in Minnesota is 273 percent, and according to Exodus Lending, a nonprofit dedicated to helping Minnesotans get out of payday lending debt, about 30,000 Minnesotans are trapped in a cycle of debt through payday loans. The severe consequences of debt resulting from a systematic lack of access to bank loans or credit cards disproportionately impacts people of color, especially in times of need. While new regulations have tried to curtail the damage of payday lending, a disproportionate number of Black residents do not have fundamental access to credit and equitable loans. Racist lending practices run deep in Minnesota too. A report published from the University of Minnesota Law School’s Institution on Metropolitan Opportunity concluded that banks in Minneapolis and St. Paul are nearly four times more likely to give subprime loans to high-income Black residents than low-income white residents. Large banks have a record of issuing exorberant subprime mortgages for homes fueling the disenfranchisement of Black people. The National Community Reinvestment Coalition published a report declaring that Black people living in the Twin Cities Metro area, around 7 percent of the population, were receiving a scant 2 percent of mortgage loans. The same UMN report noted that banks such as Wells Fargo failed to distribute mortgage loans proportionately in areas with predominantly residents of color. Connelly and her Village Trust colleagues are concerned by the exploitative and predatory environment in North Minneapolis and hope that the credit union will provide a different outlet – while also maintaining key products and services to help people succeed financially. The primary differences between Village Trust and traditional financial institutions are that Village Trust would work to lower interest rates and make all exchanges equitable and affordable. This foundational service is one that ABEP believes every single neighborhood in America needs to have. Stephannie Lewis, a Minneapolis resident who grew up on the Northside felt it was important to pledge her support for Village Trust because the movement to build a Black-led credit union touches on her personal experience. A Black-led credit union becomes a powerful tool in North Minneapolis, but Connelly is quick to point out that these cooperative tactics are not unprecedented in the Twin Cities community. Connelly sees building a credit union in North Minneapolis specifically as a risk that “other commercial, for profit banks and credit unions have been unwilling to take.” Connelly eschews reductive generalizations about North Minneapolis that construe the community as “risky” or a “bad place” to set up a business. “This community has money, this community has value, this community has potential, this community has buying power,” Connelly said. 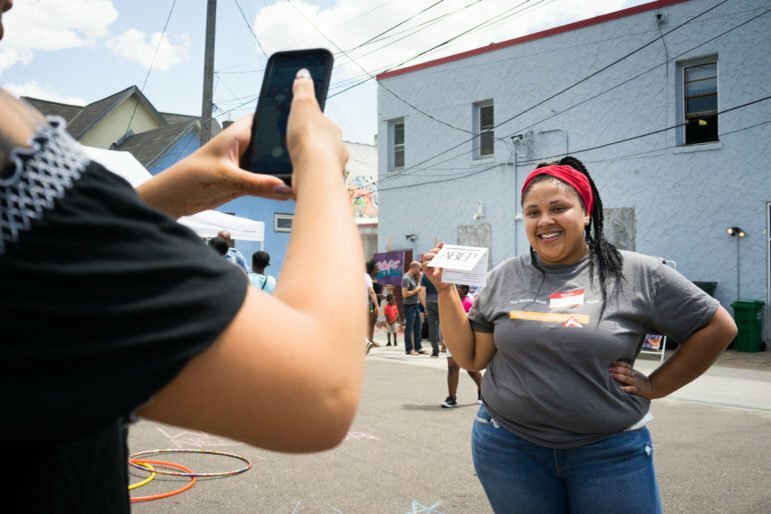 ABEP’s intern Tatum Vanyo snaps photos of new pledges to Village Trust Financial Cooperative during the FLOW Northside festival. Photo by Annabelle Marcovici. Just as the decision to begin the journey of establishing a credit union in North Minneapolis began through collective response and community-led decision making, ABEP continues to reiterate the importance of collecting feedback and remaining grounded in pursuing community needs. The road ahead is still long as ABEP works to establish a federally chartered Black-led credit union by 2019. In the meantime, ABEP needs to build its membership and generate widespread support. Currently, there is a pledge circulating where supporters can commit to transitioning their money over to the new credit union. ABEP will submit a report generated from the information gathered from the pledge to the National Credit Union Administration, so they can be issued a charter. To Y. Elaine Raussmassen, chief executive officer of Social Impact Strategies Group and a member of ABEP Executive Committee, the power of the credit union rests in its ability to democratize the financial sector to benefit the whole society. “We want them to see the potential in this, we want them to see the risk that we are taking and we want them to support us. Even if they can’t support by stepping up themselves, we want them to support by stepping up behind us and lifting us up,” Connelly said. Connelly is an activist, but also a mother. She recalls the kick-off meeting for Village Trust last month where they passed out T-shirts sporting the newly voted name with pride. The next day her son wanted to wear the shirt to school. I do just luv ya Jonathan B ~~ you ARE an inspirational awesome gentleman! I DO wish you and yours the better than best of luck in getting this 🏡 grown credit union crushing soon + call me cause I DO think I can help brother! Where or when can I pledge? I totally agree that our dollars need to circulateat within our own community multiple times BEFORE IT LEAVES our community. We have the purchasing power of a medium size nation. In 1998 African Americans had over 60 billion in disposable income. Of that we spent a great portion on retail products and sevices. The first step is the housing and management of our dollars. If we were to effectively displace our finances from the establishment financial system we would disrupt the economical system which depends on our dollars! Marching and preaching are fine however when there are injustices that effect us, if we control where and who gets our dollars this will be the biggest voice we could have! Not only would we be listened to and validated those who were so use to brushing us off would effectively come to the table. Not only them but mar corporation’s would become supporters and allies to our cause! I believe in this concept so much that I had to open an account in Atlanta Black owned bank so that my dollars will be in support of us. Once our CU opens I will be quickly transferring my fund directly back to my home of 47 years. I would love to be apart of the process of building, raising awareness and recruiting private patrons and soliciding black businesses withing our communities and expanding our reach regionally. I assume that our CU will be the only Black CU in the region so I see a massive opportunity to expand the reach and growth potential. I understand this may not be the appropriate means for a conversation of this manner, I’m just extremely excited for our community and would love to be apart of the process in some copacity. Outreach was my experience and feel I have something tangible to offer as help to exploding this real power on those that have stood infront, behind, both sides and on top of us for far to LONG!! Please provide or inform me on when commitments and/or enrollment’s can be done. Okay… is it present and open now? Or still being set up? Curious because I would try to be a customer though only w SSI direct deposit savings account and utilizing money orders and such to pay bills. Village Trust will open in 2019. You can learn more at ABEP’s website. The Trillion Dollar African American Consumer Market: Economic Empowerment or Economic Dependency? | The Black Past: Remembered and Reclaimed. With your help the #Mandate ” could and should re-configured with the formula that reflects past consumer amount of 400 BILLION in 1995 to current amount of 1.2 Trillion. We must entertain our learned subjects with a formula that will reflect possible stimulus and or surplus ..for instance when President Obama spoke of a 4 TRILLION $ reduction in the deficit over 10 year’s a formula was required. ..so ask yourself? What was that formula. .answer ! 400 #Billion a year times 10 year’s is 4 TRILLION then of course we ask ourselves where the money comes from? We then tabulate our GDP vs the National Debt from these numbers per year we are able to manage the equation…otherwise our economic specialist should be able to set goals that reflect our potential growth. .x1x5x10 and so on. ..in year’s. ..
We should support this credit union for the benefit of our community. Enjoyed the detailed article on how payday lenders are disrupting and stealing from the poor. 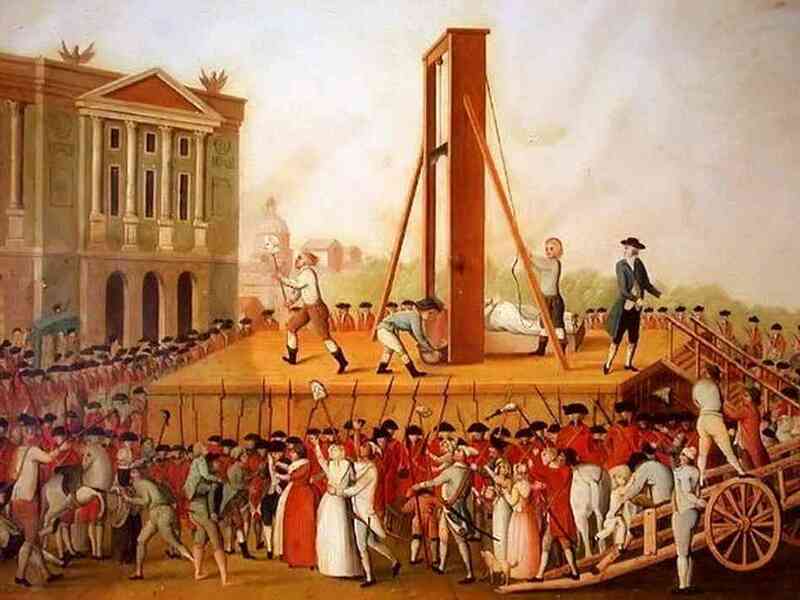 On Bastille Day, I posted a little screed on Facebook proposing that the French Revolution, which erupted 225 years ago on July 14, 1789, disproves the adage that history is always written by the winners. At least in English, I argued, the history has largely been written by people sympathetic to the aristocracy, supposedly overthrown in the name of equality, along with liberty and brotherhood.